DISCLOSURE: Some of the links in this post contain affiliate links. Know that I only showcase items I personally use and stand behind. To learn more about my affiliates, please review my disclosure policy here. You can read lots of books and hear advice from friends, but there are always some things that you have to experience to really understand. Pregnancy is, of course, one of these things. 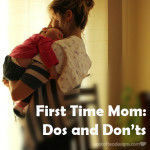 If I were to actually write what I learned during this first pregnancy, the post would be 100 part series instead of just this post. Instead, I’ve been putting this list together to help other FTMs (First Time Moms) with my “ah ha” moments or surprising little things I learned throughout my pregnancy. And PS make sure you read my other post, 10 Things Lessons Learned in my Second Pregnancy since there’s even more to learn in round two! The Girlfriends’ Guide to Pregnancy – I enjoyed this book as the first glimpse into all the weird ongoings of pregnancy. It’s written from the perspective of girlfriends sharing their gross, intimate and surprising experiences and was something I kept reading aloud to Derek during the first trimester. Sleeping Through the Night, Revised Edition: How Infants, Toddlers, and Their Parents Can Get a Good Night’s Sleep – I borrowed this from my Aunt Melissa (thanks again!) and was encouraged to follow the techniques after seeing how well her son Liam goes to sleep. BabyCenter.com – sign up for the app and the message board. 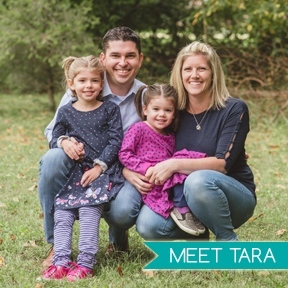 They put you in a “birth club” which basically has you on one message board with all other moms who are planning to give birth the same month as you. Even if your real life friends and family don’t know you’re pregnant, you’re able to talk to or read comments from people going through the same things as you at the same time. Once you get further along, it’s great to hear the other weird things are also going on in their lives too! Chances are you will get larger….everywhere. Be prepared to buy some items but then have to go back and buy more. At least that was the case for me. 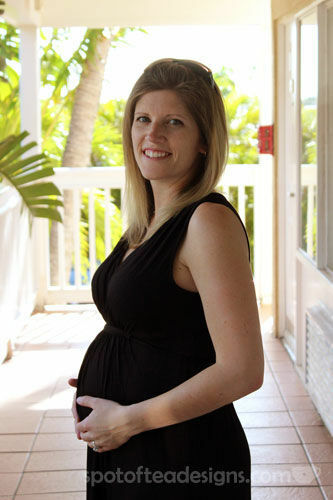 Old Navy Maternity – Pretty much most of my maternity closet came from OldNavy. They have very little physical stores that actually carry a maternity section so I did most of my shopping online. I’m usually very anti clothes shopping online, as I’m one of those girls who needs to touch and try something on. But OldNavy has a great site with TONS of reviews for all the products that give you a pretty good idea on the fit AND they have free shipping over $50 AND free returns so I gave it a try… quite a few times. Yes, there were a few things I had to return but it was no hassle at all! 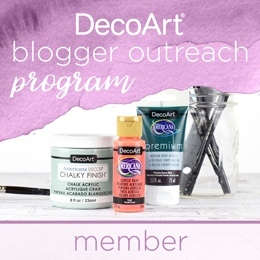 Tip: don’t buy anything without a coupon code as they come pretty often if you sign up for their email newsletters! Demi vs. Full Panel vs. Fold Over – Like my sister-in-law, Lauren, we both thought “no way am I wearing those full panel maternity pants.” Guess what? People wear them for a reason. I made the mistake and bought the demi panel pants during my first trimester and these were fine to wear into my second trimester. But by 23 weeks, the elastic band started to flip down when worn and they became more tight and restricting than comfortable. 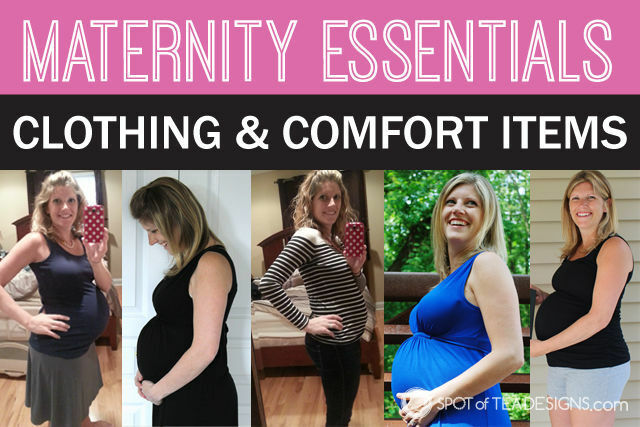 The full panel maternity pants I purchased were much more comfortable as the belly got bigger. There are also “fold over” styles of soft material items, like cotton skirts, yoga pants and shorts, which are also super comfortable and something I’d recommend, especially for your second and third trimesters. You don’t go to the doctor day 1. I always thought that when someone took their pregnancy test and when you got your BFP (big fat positive, for those not on message boards), you go to the doctor to confirm that day. That wasn’t the case, at my doctor’s office anyway. I went there the morning after I got my BFP and the receptionist said basically said, “if the test you took said you’re pregnant, you’re pregnant!” My doctor’s office doesn’t see you until 6-8 weeks for the first appointment, which I’ve since heard is very common. That’s a long time to wait and wonder if everything is ok, but get used to it! The whole pregnancy is about waiting and wondering! Check with them prior to getting pregnant so you know what to expect for that first exciting day. You can only sleep on your side. I’m a stomach sleeper so I was dreading the day when I was so overly pregnant that I could no longer lay comfortably on my stomach. What I didn’t know, was that you also can’t lay full straight on your back either! This was especially challenging when trying to find a comfortable way to lay on the beach during our babymoon. I preferred having a beach chair which kept you at an angle than laying on the beach. For sleeping, basically that leaves you with laying on your side, preferably the left for the best circulation for baby. I didn’t get a pregnancy pillow until I was pregnant the second time around and now I tell every pregnant friend to learn from my mistake and get one! I had the Snoggle and was a big fan! Ultrasound gel is really warm. Some women unfortunately have had other gyno issues prior to pregnancy where they had to have an ultrasound. Luckily, I wasn’t one of them. So at our 6 week appointment, when we’re get our first glimpse of our little girl, I was super surprised to have the gel squirted on my belly and have it be warm! 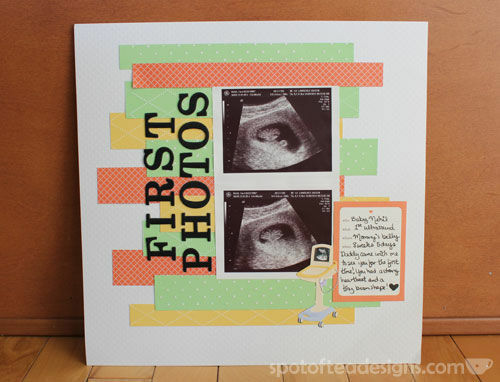 It was something I quickly forgot until we had our second ultrasound and it surprised me once again. I know it’s minor but it’s just a small thing to share. Also, before you go for your first ultrasound, do a little research about transvaginal ultrasounds. I only learned about these the night before my first visit so you might want to be prepared in case your doctor does them. 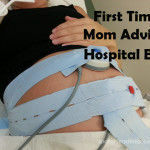 I did not have one of this type (hint: it’s not ON the belly) but I have read on message boards that some doctors do this type at the first look ultrasound since it can be challenging to get a reading with the belly type. Heads up! Stockpiles. You’ve seen all the shows about extreme couponing and their crazy stockpiles. 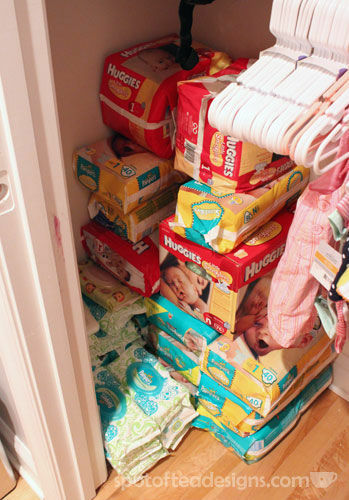 Some are pretty crazy (who needs a lifetime supply of tampons in their closet all at once?) but others really make sense. When you’re pregnant, stock pile toilet paper, hand soap, and hand sanitizer when you find the good sales! Someone sits on your bladder during your pregnancy so you go more often than normal so you’ll need toilet paper! Then once baby is here you wash your hands like crazy. 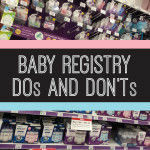 You can also use this time to start stockpiling on wipes/diapers. I found this blog post really helpful about diaper prices (look at the per diaper price, not per pack). Make sure you keep all the receipts from your baby stockpiles in an envelope by the pile, just in case you need to exchange packages for other sizes or return them all together due to sensitivity! I’ve also learned the value of the CVS extra care bucks program. I was even one of those women who made money at the store with the coupons and cash back opportunities! Want to learn more? Check out the recommended posts at the bottom of this post for other popular posts on this topic!